Do you need help finally solving ice dams or fixing cold drafty rooms? Is your home ready for a future of higher energy prices? We can help your building work better. Determine solutions to specific issues including ice dams, cold rooms, moisture damage, air quality concerns, and insulation upgrade needs. We clearly explain the building performance flaws and options for repair. Diagnostic testing is available including infrared thermography, blower door air leakage testing, and duct testing. 1-3 hours on site. We help prospective home buyers by providing an overview of the energy performance of your investment. We will explain energy efficiency opportunities and estimate costs and available rebates. Consider this an addendum to your home inspection, which often lacks details on building energy performance. 1-2 hours on site. Detailed energy modeling with Ekotrope software for accurate cost/benefit analysis for energy performance upgrades. 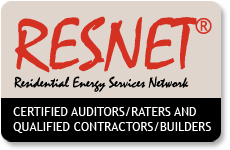 Certified HERS ratings are used for EEMs (Energy Efficiency Mortgages). 4-6 hours on site, 6+ hours reporting. A detailed assessment of your home that includes combustion safety and building performance diagnostics. Includes a detailed report that presents an overview of existing conditions and prioritized recommendations for improving building performance. 3-5 hours on site, 2-3 hours reporting. We can design and oversee your simple insulation project or comprehensive thermal boundary retrofit. We work for you, not the contractor or energy rebate program, so your interests are our interests. We leverage all available rebates and incentives and provide quality assurance testing to confirm that the installation is flawless. We are Mass Save Deep Energy Retrofit approved designers. This program rewards folks who dramatically transform their existing building with generous rebates. With lots of experience in local residential energy efficiency programs we can help you navigate Massachusetts programs so you receive the most incentive money and best quality utility subsidized energy efficiency services. With our input you will receive more value from your no-cost utility energy assessment and corresponding installation services. Contact us with any questions about the programs or your available options. Need someone to confirm your insulation installer did a good job? HIS & HERS performs diagnostics and detailed quality assurance inspection services to confirm your installed efficiency improvements will improve home comfort and energy performance as designed. Don't accept mediocre. We will confirm the project is complete.